Street markets all over the world have always been that one place where locals gather to share life and experiences. They also provide the perfect opportunity for the tourist who wants to experience the real flavor and ambiance of the country. They are much more than just a way to get groceries, markets represent and perpetuate values and traditions, keeping communities alive and connected. Italy is no different! With a bounty of historical markets, each and every region has a lot to offer to the tourist seeking to grasp the essence of our culture. 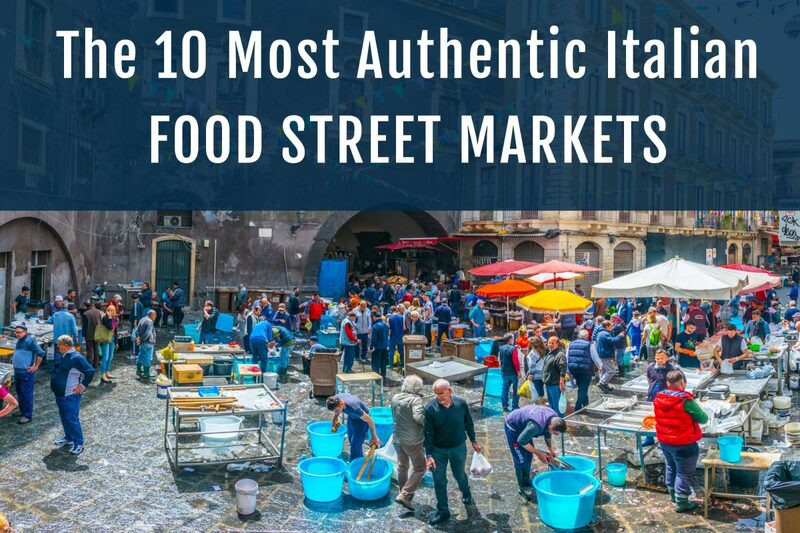 Let’s dive into the most popular and fascinating Italian street food markets – something that should be at the top of your to-do list, whenever you visit our stunning country. 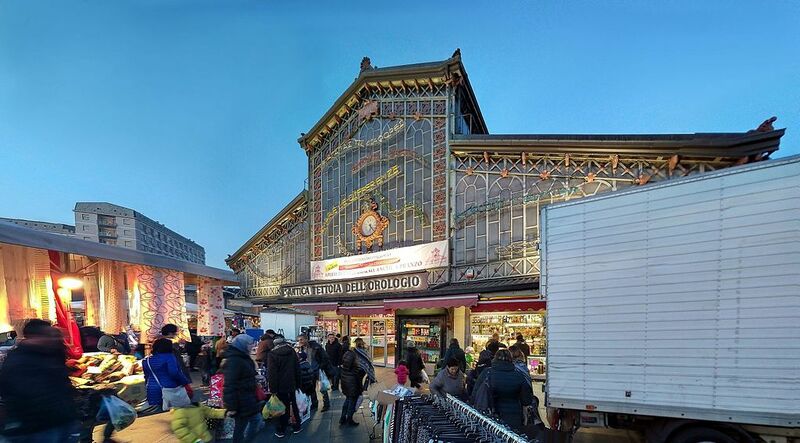 This market is unique in that it manages to attract both locals and tourists in equal measure. The origin of the name is perhaps Arabic and likely named after the village of Balhara, near Monreale, where Arab merchants first arrived. In Ballarò prepare to be charmed by the sellers who call attention to themselves with their characteristic “barking” screams, making sure no one will miss out on the fresh and delicious produces of the Sicilian countryside. You can definitely taste some Sicilian delicacies, like caponata, cannoli or get the ingredients for the traditional pasta con le sarde recipe. The name is lost in the mists of time, perhaps even before the 15th century, when the area was dedicated to the trade of grains. The tiny streets that make up the so-called Quadrilatero, in which the Mercato di Mezzo is developed, have eloquent names, reminiscent of the ancient commercial activities that were practiced there: textile street, goldsmith street, butcher street, shoemaker street, fisherman street, ironsmith street. It provides visitors with the perfect opportunity to let time stand still, breath in the atmosphere, and imagine what the area must have been like all those years ago. Today, Mercato di Mezzo is the perfect way to immerse yourself in the colors and flavors of the well-known Bolognese culinary tradition, like lasagna, with the added benefit of enjoying the evocative setting of medieval palaces. Genoa’s covered market will seem unique: the building that hosts it was actually meant to be a monastery but the structure was never finished, and at the end of the 1800s, the stalls that until then occupied Piazza De Ferrari, moved into the cloister spaces. Those who want to visit the Oriental market will be welcomed by the florists’ desks at the entrance gates, while inside prepare to be tempted by a stunning range of produce that is guaranteed to have your taste buds watering. Campo de’ Fiori is sadly known to most for the executions that took place here in the 1600s, and whose illustrious victim was the philosopher Giordano Bruno. Despite the horrible events, the name of the square sees its origin in the 1400s when there was a beautiful meadow (“campo di fiori”) with a few veggie gardens. Campo de’ Fiori is unique in that it is always a hive of activity day or night. 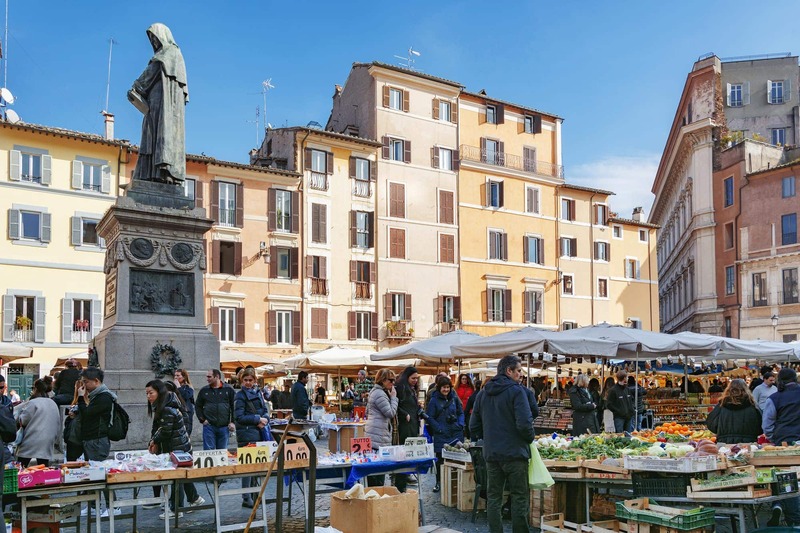 During the day Campo de’ Fiori is the core of a market that contains the most traditional Roman essence, at night though, it turns into the epicenter of Roman nightlife. Here you can enjoy the view while sitting at the numerous cafés of campo dé fiori, while having one of the local traditional dishes like: pasta amatriciana sauce, pasta carbonara, roman artichiokes, roman chicken with bell peppers, pizza al taglio or maritozzi for breakfast. Campo de ‘Fiori was also the set of the homonymous film with Anna Magnani and Aldo Fabrizi. Porta Palazzo in Turin is the largest market in Europe. For anyone who enjoys wandering around a traditional market Porta Palazzo has got to be at the top of any wishlist. 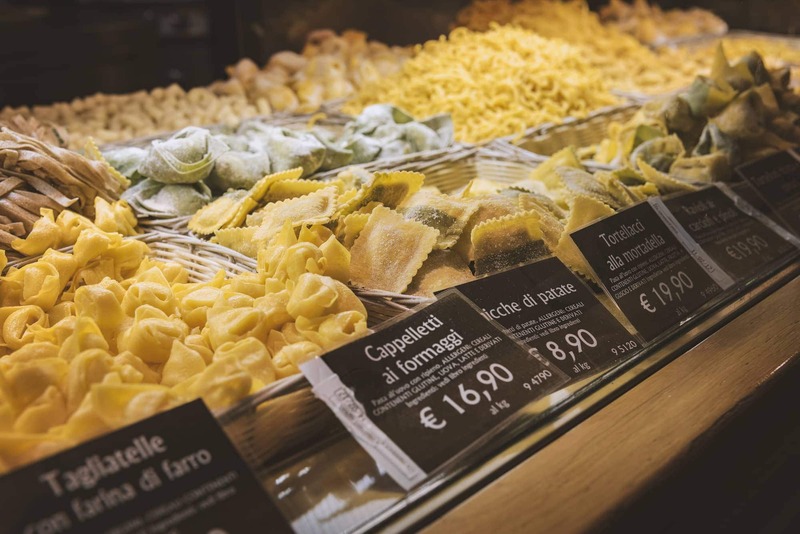 Between the sellers of honey and those of dried mushrooms, near the stall of typical Calabrian products and among the bakeries that also sell fresh pasta, you will find many kiosks with fruits and vegetables, spices and grains coming from Africa, India and South America. Literally, whatever taste experience you are trying to create Porta Palazzo can provide you with the necessary ingredients. A point of reference for the many foreigners who have found a second home in Turin and enrich the city’s gastronomic heritage. The “Loggia del Mercato Nuovo” is home to one of the most animated historical markets in Florence, right in the heart of the city. Built in the mid-1500s, the lodge first welcomed the gold and silk traders. As trade conditions changed straw hats became the main product sold, and today souvenir and leather goods stalls, fill the streets, making this market much more tourist orientated. 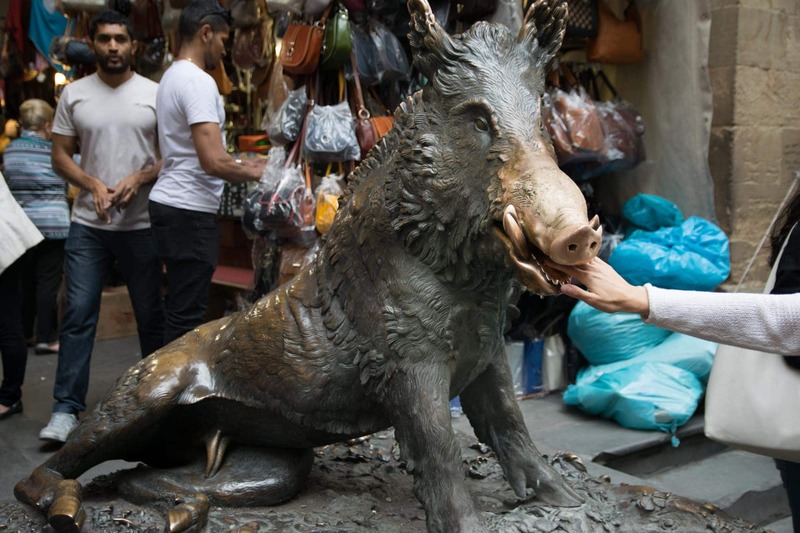 It is important to note however, that according to tradition, tourists who want to take home a souvenir of Florence should ensure that they first donate a coin to the bronze “Porcellino”, at the entrance to the Loggia, as a wish for good luck. 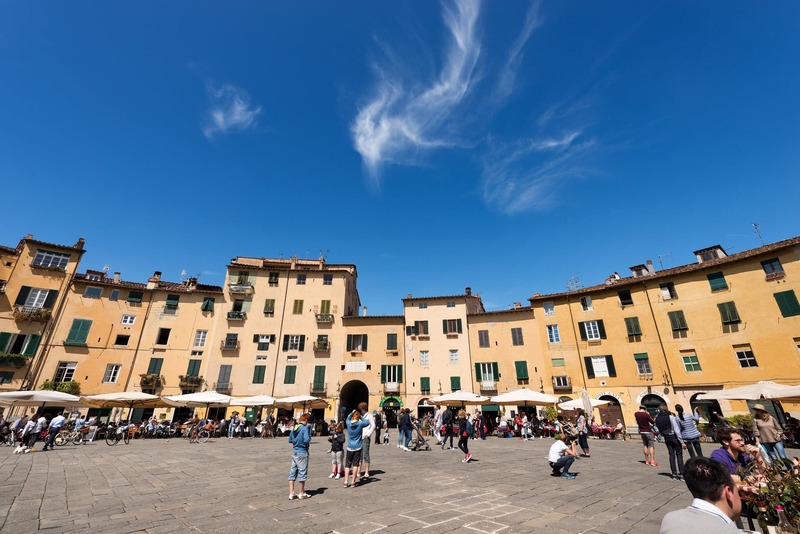 During the third weekend, of every month Lucca becomes a large open-air market. Lucca antique market is one of the most important in Italy, and certainly the largest. The exhibitors occupy the main squares of the historical center, but the most important street is the one where the market was born, Via del Battistero, which is also called the “street of antiquarians”. There are many bargains to be had here, especially for anyone who has an in-depth knowledge of the antique market. Are you willing to put your skills to the test? 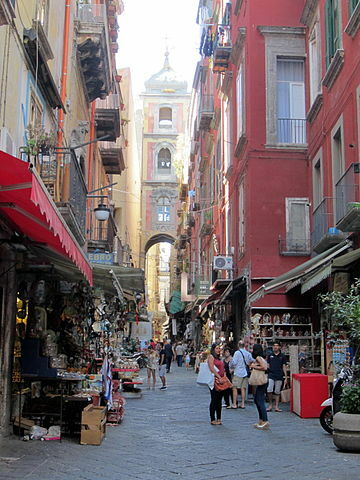 Although not a traditional market, its fame makes it one of the most visited places in Naples. San Gregorio Armeno is the street where still today you will find artisans carving little statues of the Nativity, following a tradition started in the 1700s. Here, throughout the year, the traditional and the most original statues are exhibited, with the appearance of historical, political and current figures. Don’t be shy and walk into one of these shops to observe the artisans at work, and discover how these small works of art are made in the most classic Neapolitan tradition. This market provides the perfect opportunity to experience true craftsmen at work, something which it could be argued is a dying art as automation and manufacturing take over. 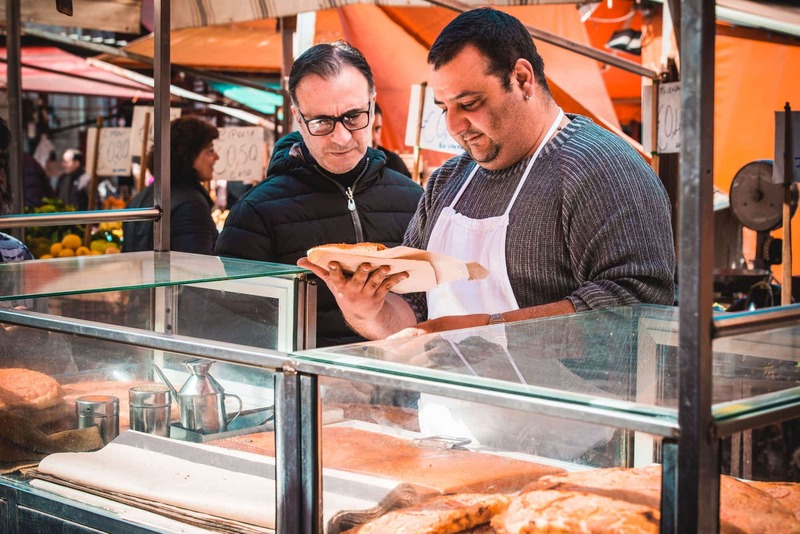 One of the best ways to enjoy a stroll in this famous food market is to grab a sfogliatella from the local baker before your walk! Venice is a magical city with many things to see and do, including, the stunning Rialto bridge, in the heart of the historical center. 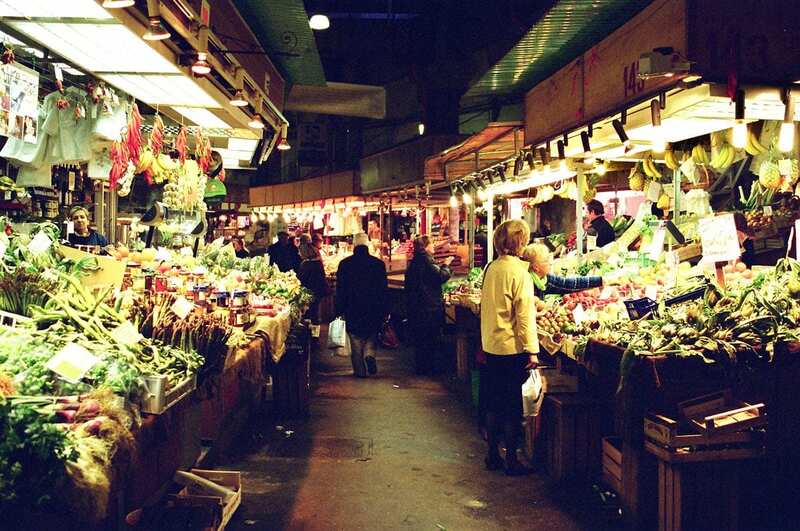 It is also home to one of the oldest Italian markets. It extends between Campo de la Pescaria and the beautiful Campo San Giacometo. 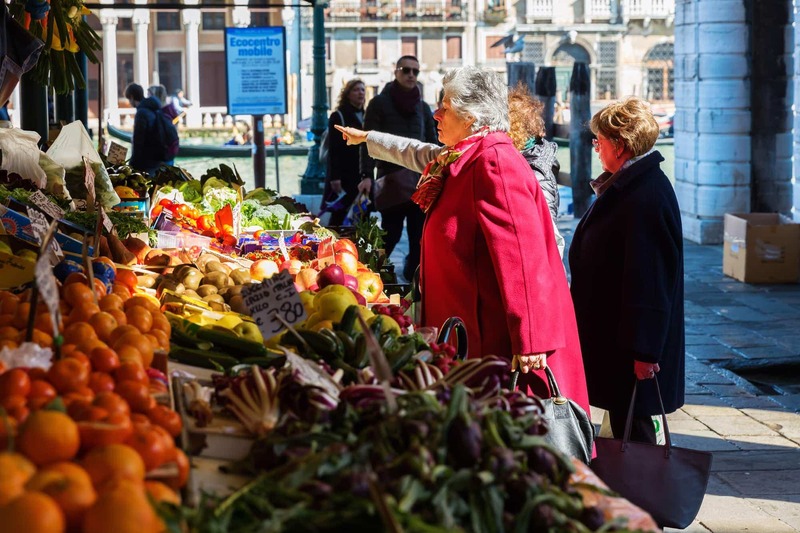 Mercato di Rialto is the perfect place to absorb Venetian atmosphere, especially by the traditional fish market and the fruit and vegetable market. The market was moved to this area in back in 1057 and since that time has represented a staple in the culture of the city. The crowd of citizens and curious tourists who walk its streets every day, not to mention the thousands of colors, voices and perfumes that animate it, make it one of the most characteristic of the Italian markets. It is a perfect venue to purchase local food and wine; the products are of guaranteed quality. For anyone trying to recreate the traditional Venetian meal, it is the destination of choice. 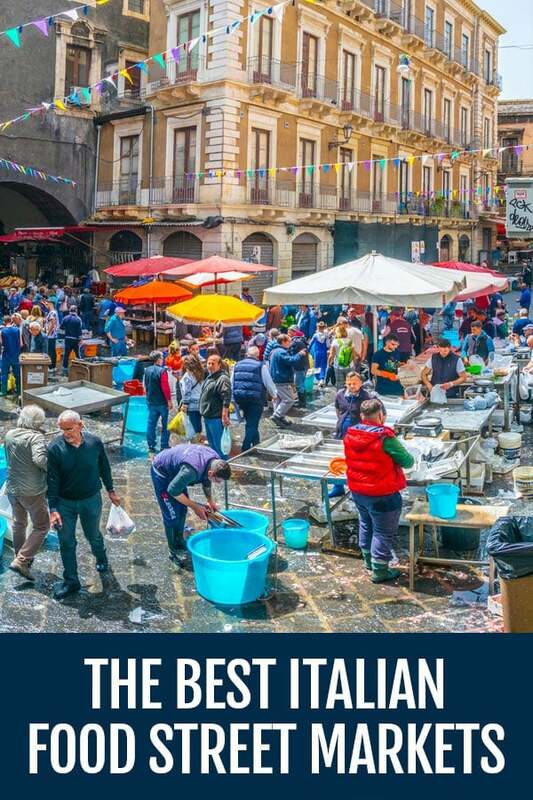 Although this article is focused on the markets of Italy, it would be remiss not to mention the beautiful setting of Mercato di Rialto. The waters of the Grand Canal, numerous butchers and Venetian traditional restaurants “bancari veneziani” provide an unusual and authentic experience that will appeal to everyone. This is where to take a break, indulge on a glass of wine and delightful finger-food. The fish really deserves a try! “Pescheria” of Catania without a doubt has the greatest variety of fresh fish in the entire country: swordfish, tuna, octopus and clams, tellins, squid, everything that the sea around Sicily can give. The stalls line up outdoors and under a historic tunnel which is over 500 years old, and has the added benefit of protecting the vendors and their produce from the sun. Fishermen and wholesalers clean, dissect and cut the fish on demand and upon request, and if asked will even share their tasty recipes to ensure that their produce tastes as good as it looks. Is there any other Italian Food Street Market you recommend us? Tell us in the comments below!